"Having been seized by Christ, we want to follow him in the spirit of the beatitudes and so become witnesses of the world to come." Jesus is Life. "I have come so that you may have life and have it to the full." The Eucharist leads us into the heart of the Christian life. Jesus' death and resurrection give perspective to every human joy and suffering, every need and every hope. The dynamic presence of Jesus in our lives finds its summit and focus in the Eucharist: I am with you every day until the end of time." Are you looking for community, prayer and Service? Eucharist makes us community. 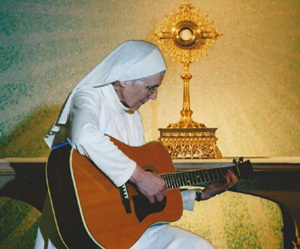 As a Servant of the Blessed Sacrament we discover Christ living in us and around us in a new way. Contemplation and apostolic love lead us to put the Eucharist at the heart of our life and choices. Awaken in us the sense of your call. Following St. Peter Julian Eymard. Making known the mystery of the Eucharist. May your Eucharistic Kingdom Come. "Community living in a simple family spirit marks our life-style. Religious life is a mystery to be lived. It is by living it that its full meaning unfolds. Eucharistic love then overflows in simple tasks. Each sister expresses her love and service according to her gifts and the needs of the community. One may organize and develop the Eucharistic Association, another may guide Eucharistic Retreats. We may sponsor prayer opportunities for youth and adults, bring communion to shut-ins, or simply lift up in prayer the intentions recommended to us. 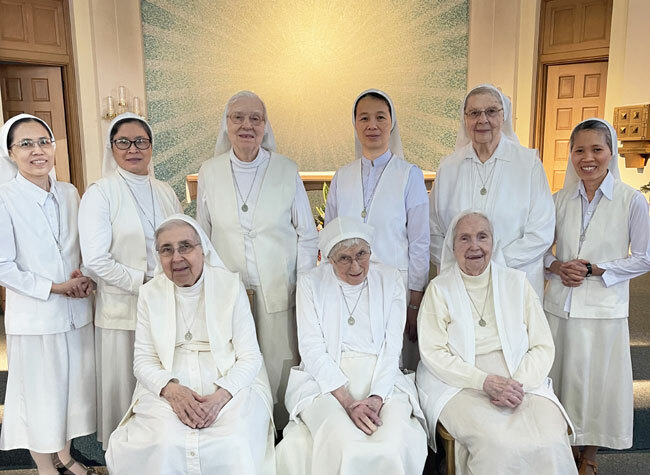 Within the community we care for the sick, tend the sacristy, prepare the accounts, do housekeeping chores, tend the library, do the music ministry in the Chapel and other tasks. To help support ourselves, we retail altar breads to the local parishes. In our Congregation today, we see values associated with contemplative life: fidelity, serenity, patience, gift of self, adoration , immolation and union with Christ. Union with the mysteries of |His redemptive suffering reflects a simple but profound life in God. So that Christ may live in us more fully, we take vows of chastity, poverty and obedience in community. We are responding to the lavish goodness of God who is never outdone in generosity. Joyful self-giving brings the hundredfold of joy which Jesus promised to all who follow Him. Consecrated celibacy means responding to Christ's love with mind, heart and will and consecrating to Him our power to love others together with him. Poverty means finding joy in the simple things of life, and using them for the service of God as we place our trust in Him. Obedience means to listen for God's voice and His will in events, letting ourselves be called forth to new challenges and new tasks, finding new meaning in routine events and serving one another in love and joy, under the direction of our Superiors. "We welcome God's Word in union with Mary the first Servant of the Lord. With her, we want to be open to the action of the Holy Spirit to bear fruit that endures "by purity of life, humility of love, and the joy of an entire devotedness." Postulancy. The candidate deepens her Christian life while being introduced into the experience of religious life, learns the life and history of our Congregation and acquires better self-knowledge. Postulancy lasts from 6 months to 2 years, depending on the individual's readiness. Novitiate. The candidate prepares for commitment by a study of the vows and a more in -depth study of our spirituality. It lasts 2 years. Juniorate. The candidate takes annual vows for 3 to 6 years. During this time she completes her religious studies, lives our life more fully and prepares herself in a practical way for her mission according to her gifts. Final Vows. By taking Perpetual vows, the candidate becomes a full member of the community.